Importance of a good turnout in making a favorable first impression cannot be stressed enough. Yes, being at your well-dressed best will not make you the teacher’s favourite easily but if you look untidy or unkempt on the very first day of the new school year, the teacher is likely to remember it in an unfavorable way for a long time, probably throughout the academic session. So put in some effort in wearing a clean, neatly ironed dress and polished shoes, grooming your nails and hair. It doesn’t matter if you find it silly now that you are in Class 12 or Class 10, discipline never goes out of style. Just like each subject, every teacher is different too. It is possible that your Class 9 Science teacher loved to teach the fun way but the teacher for social science of Class 10 has a more serious, non-nonsense approach. So, don’t jump the gun in trying to show how smart you are, especially if you don’t know the teacher from before, or pull a fast one. Give yourself sometime to understand and settle into your new teachers’ ways and then aim for fulfilling their expectations of you. Take on proactive approach toward classroom learning by participating in classroom discussions as well as question and answer sessions organised by your teachers. This is especially important for subjects like Class 10 mathematics as well as all the elective subjects you choose in your Class 11 and 12. Interacting with the teacher and other students during these sessions will not only help improve your understanding of concepts but also put you in the limelight. Keeping up with classroom lessons can get a tad monotonous when you have five or six classes to attend, back to back. While it is easy to lose focus and be lost in your train of thoughts even as a teacher proceeds with the day’s lesson, you must train your mind to listen and grasp. The best way to do so is to take notes in every class. Not only will this help you keep up with what’s being taught in the class, these notes will prove to be a savior when preparing for class tests, mid-terms and final exams. It is particularly important to inculcate this habit in higher classes like Class 9 and beyond. Even if it means having to refer to the time-table for the first few weeks, make sure you carry all the necessary textbooks and notebooks to school every day. Not having the required study material sends out the impression of lack of sincerity and you don’t want to be perceived as an insincere student if you want to make a mark in the new school year. Every school has its fair share of clubs, teams, societies, among a host of other extra-curricular avenues. Look for the ones that interest you and give it your all to get selected in the school team for activities of your interest. In addition to sports teams, you can also aim for academics based clubs. For instance, if you are an ISC class 12 student pursuing science, you can join the school science club. If your area of interest is English, you can join the debating society or the theater club of your school. Extra-curricular activities provide a great avenue for all-round development of personality. The boost in self-confidence that you get from this exposure will stand you in good stead in the long run. We live in an era of stiff competition where going the extra mile holds the key to success. Like every other aspect of life, this paradigm holds true for school education too. Bring on your A-game by supplementing textbook learning with additional sources such as e-books, and online tutorials. For instance, if you are a Class 12 student, referring to supplementary study materials will help you develop a clear understanding of tricky concepts, enrich your notes and answers, and ultimately, score those extra marks in your final exams that can put you ahead of your peers. It may sound strange to draw up and follow a study schedule right from Day One of your new school year but putting in a little effort everyday will save you the trouble of burning the midnight oil ahead during exams. Even if you don’t want to get into the thick of it by studying every single subject every day, dedicate an hour besides homework time to study at least one subject per day. 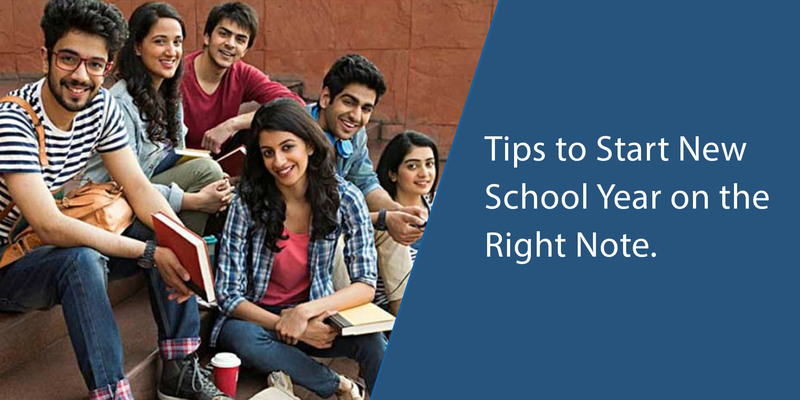 It is also important to focus on subjects that have a vast curriculum such as physics of Class 11 or the ones that you find particularly difficult. Your time at school is a lot more than just textbook learning. Everyday spent at school helps shape up your personality and the person you’ll grow up to be. It is, therefore, imperative to soak up new experiences to hone a dynamic, multi-faceted personality. Make new friends, learn new skills, go on adventure trips and picnics, get involved with social causes – be open to the idea of embracing new experiences before making up your mind on what’s meant for and what’s not. Approach a new school year with a determination to give you best and the rest will follow.